On DQYDJ, we often get a simple question: “what is the correlation of income and net worth?“. 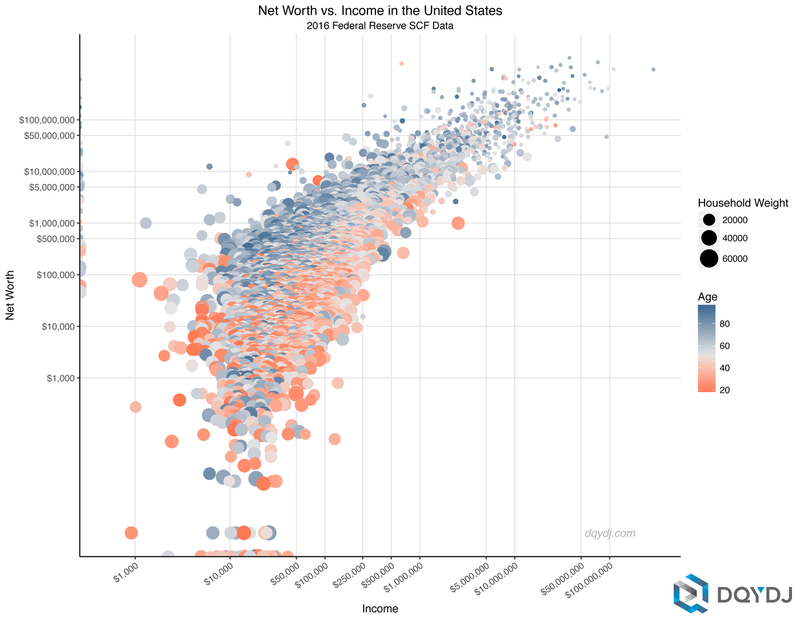 Although the question flows from the conversation around the one percent in net worth and income, it turns out income does not predict wealth well. In 2016 in America, the correlation of income and net worth was only .5069, for an R^2 of .2569. An R^2 of .2569 for this linear model is a weak coefficient of determination. This number implies 74.31% of the variability between income and net worth remains unaccounted for with these variables. While income certainly has a hand in net worth (and there is causation) there are factors other than income at play. Above we’ve graphed individual responses in the 2016 Federal Reserve SCF with income on the X-axis and net worth on the Y-axis (and a logarithmic scale). Because a survey can’t sample all of America, the size of the point reflects the weight of a response. Further, the point color represents the age of the householder (grey is set to the average: 51.679 years old). As you see in the bubble plot: if we instead took the Pearson correlation coefficient of the log10 income and log10 net worth is better than the naive linear model quoted in the intro. Look at income as acceleration – how quickly a household can add to its total wealth. Net worth, on the other hand, is speed or how fast the car is currently moving. We know – it’s not perfect a perfect analogy. You can convert net worth to income to a large degree, but not necessarily the reverse. When you consider taxes on net worth versus income, the United States limits the speed a household can accumulate wealth. On the flip side, only very wealthy households (see our household net worth percentile calculator) are taxed on their estates. As we telegraphed through the graph, variables like age matter a ton (check out our net worth by age calculator for a detailed look). You should expect a 25 year old and a 65 year old both making $100,000 a year to have wildly different household wealth. Furthermore, there is a large group of people with little to no income and substantial wealth. That’s right – retirees. Age gets you part of the way there when analyzing net worth and income. It doesn’t account for everything. Ideally, to get an idea of how households accumulate wealth, you need longitudinal data. Longitudinal data comes from a survey that tracks a single family or individual over time. If you know current net worth and past earnings, you’ll find it much easier to wrap a narrative around the two. For surveys such as the SCF, you’re only seeing a snapshot of a household’s finance. You see their current income and net worth. Without information on the household’s income history, you don’t know the whole journey. Not every household handles income in the same way. Unfortunately, this is particularly the case for households with very large incomes which come outside a ‘traditional’ multi-decade career. Call it the “lottery winner and athlete paradox”: some people earn large incomes in a short span and later file for bankruptcy. ESPN’s addressed this paradox in the 30 for 30 Broke and we talked more in our accredited investor article. On the other end of the spectrum are frugal or dedicated people with enviable spending habits. For example, Ronald Read famously passed away with an $8 million estate after a career as a custodian and gas station attendant. Jacob of Early Retirement Extreme and Mr. Money Mustache both retired early due to intense attention on their spending habits. A more detailed treatment of the correlation of income and net worth would account for both spending and taxes. Luck – good and bad – also plays a role. For some households, inheritance plays a massive role in wealth. And, like inheritance which requires death, unfortunately, not all luck is good luck. Medical expenses, failed business and educational ventures, and acrimonious divorces can leave a lasting impression on a household’s net worth. We start with the 2016 SCF Data from the Federal Reserve, and export all 5 imputed data sets. To combine them back “into individual responses”, we used the weighted average of both income and net worth and added up the replicate weights. That left us with an approximation of the 6,248 public responses, representing ~125,981,701 American households. This methodology is more accurate than the 2013 effort, but they’re probably close enough to compare. If you take anything away from this piece, let it be the fact that most quoted studies are just a snapshot. You can’t compare a stock and a flow without a reasonable guess at persistence or history. While year to year incomes often don’t change a ton, they do change enough (especially around retirement!) to confuse the income-net worth relationship. You’d do better if you knew a household’s income history and layered spending, taxes, and luck on top. Next up in this series, see the net worth income correlation for high net worth and high income households. Until then – remember the rich bloggers and the poor lottery winners. We hope you enjoyed this look at the correlation of income and net worth. I wonder if instead of using just income, and instead using an income to cost of living ratio or a cost of living adjusted income, would there would be closer correlation? The problem with cost-of-living is as you move up the income and net worth scale you’re less sensitive. E.g. net worth of $10,000,000 (roughly top ~1%) wouldn’t worry as much about the day to day costs of, say, Manhattan vs. the Midwest. Taxes or spending habits would explain more – “Makes a million a year, bought expensive art” doesn’t show up in cost of living. The other issues are data-driven. With only 6,248 public data points, the Fed stripped location data from the responses. There isn’t really an ‘agreed upon’ high resolution dataset either; BLS has CPI, sure, but it’s not a cost-of-living measure: https://www.bls.gov/cpi/questions-and-answers.htm#Question_4 . Best bet might be something like Numbeo: https://www.numbeo.com/cost-of-living/ but it’s still a hard concept to generalize. In addition to cost of living,, I bet that age is the other variable that explains this. I’ve got age in the hopper – like you saw in the 2013 series the correlation itself varies by age as well (retirees, obviously, coming in with very weak correlations). It would be really cool if this was interactive with a slider bar to select different age ranges as desired.